Despite relativity, there is still aesthetics in ranks. Those aesthetics have an structure as we see them repeated as a trend in ranks ordering at different lists. We have to show default podiums for the concepts of a triad and there would be a primary one in a duality, despite due to relativity: a primary has not a 50%+ hierarchy over its complementary pair. Flove needs modelling interactive applications starting from Personal to below in the full view. It is in the layer of Rationality, and personal as its first child (see full view), where we can first reason about improving ourselves with better mechanical interactions. All upper layers than Rational (i.e. Mental, Natural, etc) is unknowable territory for modelling and suggesting concrete technological mechanics further than better explanations of them. An offer of a thing is information to reach an agreement of transfer of use of a material thing, where there are two people looking for minimum (that can be transferred) of equivalence of rational value (immaterial) (fair and convenient ratio) and of equivalence of material value in the proposed relationship. We identify the search process of rational agreement as more valuable than the search according to the material equivalence. The thing as an excuse to improve a relationship. In the search for immaterial equivalence will be key when the offer of economic relationship develops you as a person, how pleasant it contributes to the relational link, and also how much social impact it proposes. To encourage more this is that it is especially important to have good user profiles and relational recommendations in a place where things are offered. We have tried, especially in the social sciences, to understand life from the bipolarity of the personal to the social. But to this equation we can add an intermediate value between both for a better positioning, filling and proposal of coexistence between both. The local is the close to the personal, the social the other that we do not cover with our daily local direct interaction. When a person has a rich self-esteem and personality, they are less subject to being harmed by the emotional attacks of their nearby premises. If several people are organized among themselves to self-supply many of their basic resources, social institutions are no longer so necessary for them. A baby when it is born, a child when he thinks or we adults when we think things with enough patience, we can understand very well that we are beings come from a nature, which end up being reasoned. During the first reason, we see ourselves as people looking inwards (the personal), then we study the surrounding environment that can be grasped from the outside (the local), and then we reason on the general organizational model (the social) that we want to relate to each other of the areas of our person and close environment. This seems so obvious and simple to understand is complemented by the tendency to believe that the rational, especially the social, is above the natural, the local or the personal. The universal, natural, biological or mental is not more global than the social. The social is the last son of the rational. 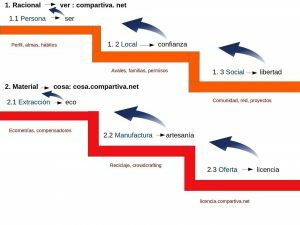 People who place the social over the personal can have all the goodwill of the world to do so because they believe that the «global» precedes the personal, and that global call it social, a more cultured synonym of «natural» according to this version. This positioning does not stop being a tactical vision of sacrificing his personality or his locality to better refine the social, simply because that person feels that the social needs more coherence at a general level. But maintaining this position as a belief (beyond just a tactical perspective) extends our disconnection from the natural environment, uproots us from the mental, promotes an unsustainable material management model, very adversarial ways of reasoning, very exclusive family models or very few initiatives of general interest that we managed to build all together, compared with the huge growing rational potential we have for it. The things are extracted and elaborated to be used and for the thing to become what it is, it has been wanted to extract and manufacture so that it ends up being used with a more or less concrete mechanical purpose, which in turn has been rationally planned, even before starting to extract the materials with which it would be manufactured. The final satisfactory use of the thing is not only positive because it is used in itself, but the satisfaction of the relationship also encourages new extractions and manufactures. If these have been organic and artisan, it will be easier to dignify the contractual relationship, and more will be encouraged that the next offers are more ecological and artisanal. But we must begin by assessing these two qualities already before. That is why it is important to highlight them in the markets and from the common incentive to offer more products already taken care of from their base. In this sense, consumerism only becomes a problem when we consume by evading greater reasoning about how much we need that, or if we consume things that harm us as people or society. The consumerism of ecological and craft things is a good habit to promote. Most of our economic activity is based on the gift and the loan, being the exchange a rest of it, although from the academies the loan and the gift are despised in favor of an exchange-centric or absolute economy. But we have to pay attention to that we are constantly giving away ideas and lending things. Giving, lending and exchanging are three areas related to each other. When we think about exchanging, the vibration-pressure of lending or giving is also present and close. Exchange tends naturally to barter (a practice close to the loan) and barter tends to lend. Lending tends to share (a practice close to the gift), sharing tends to give and give away tends to release (the most rational transformational practice possible). Giving gives more possibilities of active use and ease of equivalence than the loan, the loan gives more possibilities of active use than the exchange, simply because the material consideration is lower (a gift or loan is cheaper than an exchange). Can you imagine that we had to calculate the equivalence of exchanging all the favors or minutes of attention that we give to others? When we lend and give away we avoid the concern for an equivalent material consideration given in the exchange. On the other hand, by sharing, we desecrate the boundaries of the need for material equivalence by giving more than what we are going to receive immediately, and when this is done appropriately, it causes a desire in the recipient to transfer equivalence, but within a framework of supposed intangible consideration ( rational). Thus, the recipient of a loan, even if it does not have equivalent material values, will try to reach the line of equivalence to its borrower with the rational values ​​it possesses (at least show sufficient rational gratitude), which translates into a increase of confidence that will please him enough to who offered it to him, since for him it meant a proximity to the hour to be able to lend something of her also later. Actually, the applicant does not necessarily need to show strong thanks in response to match or pass the equivalence. If he did not do so, in the context of a loan satisfactory to the lender (without damages in the return on the return of the thing), the lender will at least remain sufficiently satisfied by the fact of having been fair – having arrived a – assured of the equivalence in the treatment of the applicant. We simply want that each offer does not bother us a lot when thinking if we are acting strategically and adequately well with respect to our forecasts of future shortages of what we are giving off. Apart from issues of trust with the person to ensure security with the object and maintenance of pleasantness in the relationship, this is the main reason why for many people the loan seems more cumbersome than an exchange, or why We hesitate not to give and we decided to just lend. These tactical decisions are the explanation for why there are more vital trade-offs than some gifts or loans, as well as loans that provide more vitality than some gifts. We only give away more if we do not need to pay to exchange so much for the same thing later or because we need the money soon. We want that every offer we make does not bother us a lot when it comes to thinking if we are acting strategically and appropriately.